Trendy wedding, fancy car, gorgeous bride! Give this blond beauty the best day of her life! Choose a pretty wedding dress for this fantasy doll wedding. This cute couple is getting married and needs a cute wedding outfit! Can you help them to find a suitable outfit and give them a happy wedding? Be happy and get married with this blushing bride and her assortment of one of a kind fabulous veils, dresses, leggings, shoes and accessories! Style this happy couple for a country wedding at sunrise! Frilly, shiny, lacy and fancy everything in all your favorite natural colors and cute hats and boots for the groom! Use your mouse to click on and through the floating clothing, hair, background and accessory options. These absolutely beautiful wedding dresses have a classic elegant style perfect for any wedding! Help this beautiful doll dress up for an upcoming wedding, a fantastic wedding with so many gorgeous flowers and pretty guests! Hop on the back of a motorcycle and ride off into the sunset in style! This happy couples one of a kind wedding is over the but fun and the fashion is just beginning! Getting married is the happiest day in one's life. So dress up in beautiful dresses and suits to experience the day in style and comfort! Select from the most modern and stylish Euro wedding dresses! 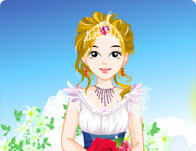 Mix and match wedding dresses and accessories in this fun wedding dress up game. You'll have a lot of options to choose from right down to your shoes! Skull speckled veils and black hearts everywhere! This emo couple knows their way around fashion. Custom veils, bouquets and gowns all done in trademark emo style await! Kimonos, gowns, and floral covered everything. You'll fall in love with this fusion of traditional and contemporary Japanese wedding fashions. Fairies do get married too! And this gal is no exception at all while she is deciding what to wear so she looks just like a bride from a fairy tale! It doesn't get much more crazy than a mounted wedding atop a mighty steed. Get wild and go nuts with full length gowns and veils! Marry the cowboy of your dreams in this fabulous old west wedding! This gorgeous gal has chosen the best time of the year to get married. Help her choose the perfect wedding dress for this perfect spring day! Welcome to the happiest day of your life! Put together a blushing bridal gown and top it off with a one of a kind hair do. Match it all to a fabulous bouquet and you're ready to say "I DO". Put some 'ooh la la' in Honolulu' and make your special wedding day a sun stained explosion of fun, fashion and love! Don't be bashful! Show some skin on this withdrawn beach wedding ceremony! Help Marie do her make up and choose the perfect wedding dress, so that she matches husband! Pick one of those colorful wedding dresses for this happy bride.